Turbot is not the least expensive of fish, but it had a very delicate taste and the meat stays firm during cooking. 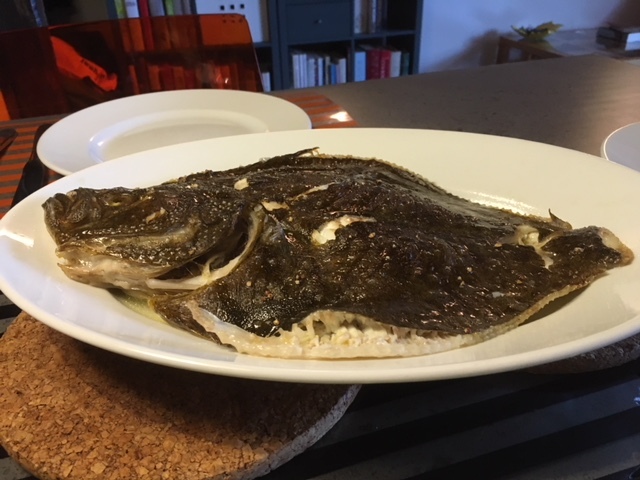 In France, there are many recipes with parts of a large turbot – of up to 5 kilos – with white sauces, mushrooms, shrimps and oysters or mussels. I do like mushrooms, shrimps, oysters and or mussels but as often with complicated dishes the accompanying ingredients steal the limelight from the main actor. Also, many of these sauces are on a butter or cream basis and cancel out the dietary advantages of the lean fish. So here, I had a turbot of about one kilo. I trimmed the fins and washed the fish thoroughly. I pre-heated the oven at 200 °C and lined an oven dish with cooking paper. I put the fish on the dish, added a bit of olive oil and put it in the oven, top side up. After 20 minutes I added some pepper. Here I could have added some white wine or lemon juice, but the fish had shed some juice of itself and was nicely cooking. I continued for five minutes, let it cool and transferred the fish to a serving dish with the aid of the cooking paper, after having let run the juices into the oven dish. I served it with stir-fried chard, fresh garlic, leek and basil.